With an uncommon dedication to the music of our own time, the Norwegian violinist Peter Herresthal has become recognized as an inspired interpreter of contemporary works for the violin. Previous, acclaimed releases include concertos and chamber works by Arne Nordheim, Olav Anton Thommessen and Per N�rg�rd � released in 2011, the latter disc was shortlisted for a 2012 Gramophone Award. Herresthal has also initiated the project 'A string of releases': recordings of contemporary works for violin and orchestra primarily intended for digital release. The digital album with Thomas Ad�s' violin concerto Concentric Paths, released in 2014, was followed in 2015 by two releases featuring music by the Norwegian composers Henrik Hellstenius (b.1963) and �rjan Matre (b.1979). These two digital-only albums have now been gathered on a Hybrid SACD, combining two violin concertos as well as two shorter orchestral works. Both composers wrote their concertos expressly for Herresthal, whose own brand of violin playing and exploratory spirit have put a stamp on the finished works, from 2013 and 2014 respectively. 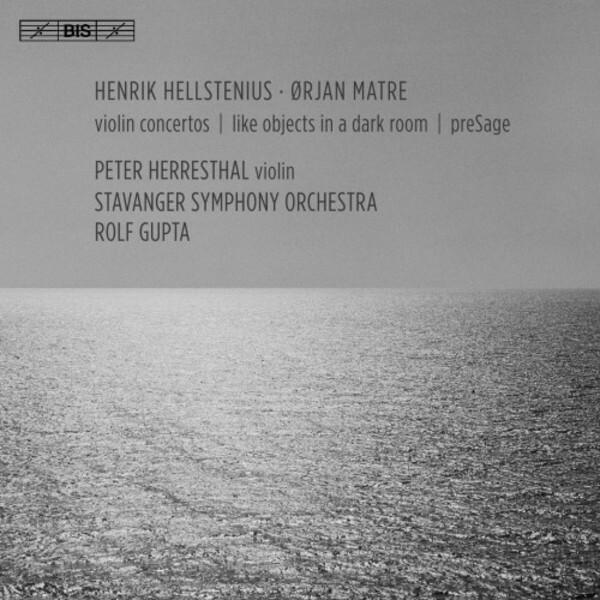 Herresthal is supported by the Stavanger Symphony Orchestra and conductor Rolf Gupta, who also perform Hellstenius' Like Objects in a Dark Room � described by Tom Service in his engaging liner notes to the disc as 'a spiralling sonic sculpture' � and Matre's preSage, which takes as its point of departure the brief section called The Sage from Stravinsky�s Rite of Spring.